This week Microsoft is hosting its big Ignite conference in Chicago and based on comments from some people in my network I was alerted to an intriguing announcement about Microsoft releasing a new integration between outlook and OneDrive by the end of 2015 that would allow attachments to reside in OneDrive and shared and co-authored across recipients both internal as well as external without the need to actually ‘attach’ the actual file in the mail itself. If attachments are stored and referenced from globally accessible cloud storage it saves on data being transfered across networks and cluttering our mail servers. Furthermore…. Single point of data means that other great options like online simultaneous co-authoring are possible! It is in fact the basis of true collaboration and it is something many customers have asked for. This is where Microsoft is trying to make a difference apparently. The idea being that you don’t have to ask yourself whether someone has access to the central storage depository (OneDrive) or not. Based on the recipients email address the system will simply check whether the recipient is a known user, prompt the user to create an account so he or she can then authenticate and open and edit the file. This is where I actually got a bit excited while watching the recorded session as they recognize this scenario and are actively working on including other cloud storage systems like Dropbox to work with this feature as well. So no vendor lock-in on OneDrive… nice! I am curious though as to what the larger implications are going to be with this. The main one being data consistency…. Like how do I, as a recipient, ensure that the attachments I receive in this way remain unchanged and available? With attachments received in the old fashioned way the sender would not be able to change my copy of the mail/attachments as it would physically be located in my mail box. With this new way the attachment on the OneDrive location can easily be changed or even removed by the author and/or other recipients. This could cause questions in regards to legal implications and E-Discovery needs. Overall I think Microsoft has just throw down a serious challenge to the other major players in this market and I look forward to seeing what they are going to do! The session “Rethinking attachments: Collaborating in Outlook with OneDrive” is available online.Watch the session here yourself (I’m not sure how long this will be up) or check out the sessions detail sheet. This blog is follow up in a series of blogs on Folders in IBM Connections. For full understanding I would recommend reviewing the previous blogs: #1: Community Folders, #2: Ownership of files and folders and #3 working with folders first. So in the previous three post I explained a bit about the ins and outs of IBM Connections folders, the different flavours you have and how they work and differ from each other. But the question now is how do you use them…? The truth is that each organization is different and each situation is different. IBM Connections is a social business platform that offers you tools that can help you stimulate collaborative work and knowledge sharing and there really is no ‘right way’ or ‘wrong way’ as long as you can achieve that. Having all three different types of folders (Shared Folders, CCM Folders and Community Folders) means you just got more options to find YOUR way. But to do so it is important to understand how each of them function, what their strongholds are as well as possible weaknesses. In the previous 3 blogs I’ve tried to give you an overview of those strengths and weaknesses. Having so many options that work so differently at times can be quite confusing. Can you prevent users from using a certain type of folders? Well in a way yes, by simply deactivating the whole feature. Shared Folders is part of the personal files, as far as I know you can’t easily deactivate those without deactivating personal Files too but I’m no admin so check with your admin before dismissing that. CCM Folders require CCM Licensing and an additional installation. You can definitely choose not to buy it / install it. Then again, that would mean you lose some great features that CCM could offer to your organization so make sure you fully evaluate before deciding! Community folders, which is part of the default offering as of IBM Connections 4.5 CR4, has only recently been released and it requires a specific act from your administrator to activate so again, that is something that you can choose to do, or not. But….! Don’t just dismiss these options. Make sure you test them and discuss them with your users. They might in fact solve problems you weren’t even aware of. In that sense, having so many different options also means you have a rich variety of possible use cases. Just make sure you are aware of how each works. Do not implement CCM just so your users have nested folders…. Yes, I know having this option is a great selling point for CCM but it will always fall short in replicating the functioning of their file shares, even with subfolders. If that was the only reason to implement it, users will only get disappointed. Instead, highlight the other benefits of social file sharing and look at the other features CCM offers like approval cycles, document types and the option of having users control the security access levels to it. Use that to show users why CCM could be a great thing to use. 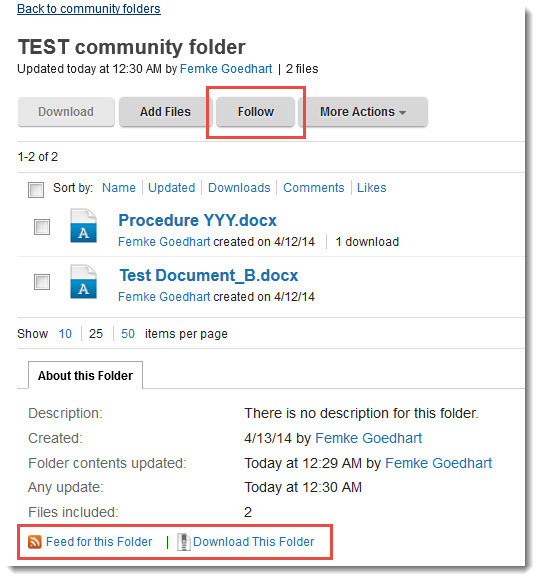 Inform users of the Ownership differences between Community Files/Folders and Personal Files/Folders. Try to come up with a strategy with them, on when to use what. There are clear cases where personal files are preferred but in other situations community files can be a better way to go. If for no other reason than to at least make sure they are, by default, editable to all community members or ensure a better security within a community. Do not use Shared folders in Restricted communities. See this blog for an explanation why. Train your key users so they know how IBM Connections Files & Folders work and provide cheat sheets so they can understand and explain to other users why certain things work the way they work. Try & experiment. As stated before, IBM Connections is a platform offering more than one way to go. That is its strength but sometimes is also seen as its weakness as it can be confusing to users. Find out what works for your organization and base your content strategy on that. Lastly, but probably most importantly…. If you haven’t done so yet, explain to users what the key thoughts behind IBM Connections is and try to get them to realize that when it comes to Sharing information in a social platform, the premise about who should have access to a file or folder shouldn’t be “I, unless…” but “Everyone, unless…”! So have I covered everything there is to know about IBM Connections folders? No! There are whole areas I haven’t even touched upon. So I will most likely be publishing more blogs on this topic in the future. In the meantime, let me know if you thought this series was helpful or if you have any questions by posting in the comments. This blog is follow up in a series of blogs on Folders in IBM Connections. For full understanding I would recommend reviewing the previous blogs: #1: Community Folders and #2: Ownership of files and folders first. When I was starting this series of blogs on the different options of sharing files & folders within IBM Connections it was mostly influenced by my own interest in how it all worked. As a Business Consultant specializing in both Document Management as well as Social Business anything having to do with structuring file management interests me. So after our test environment was upgraded to IBM Connections 4.5 CR4 I set out to test how the new Community Folders option fitted in with the two existing Folder options in IBM Connections: Shared Folders and CCM Folders. A big part of this is that IBM Connections is a Social Platform, concentrated on offering users ways of sharing large quantities of information that is mostly unstructured. This, in contrast to ERP and document management systems that deal mostly in structured information. But the lines between structured and unstructured information is not as clear cut as most people would like it to be. Certain documents could fall in both categories depending on the user or situation and because of this you see that more and more solutions are trying to straddle the fence between structured & unstructured information management. With overlaps in functionality and requirements and often confusion as a result. It’s a common problem for most systems trying to manage diverse flows of information. The place where this is most visible within IBM Connections is the way it handles Files & Folders. ‘Social die-hards’ will tell you that in situations where unstructured information is stored and a need for organizing or categorizing arises, folders fall short. They advocate “tagging”, another feature IBM Connections has. I agree! Tagging, a more fluid and user driven way of categorizing and linking files, can greatly help in making unstructured information more findable. Tagging, by being flat instead of hierarchically structured, allows a file to have numerous tags by numerous people. Often even giving weight to the number of people who tag something and how often it is tagged with the same tag. A file can have dozens of tags but in general can only be in one folder so when a file is not as unilaterally recognizable as belonging to one category folders often fall short as you have to choose, whereas tagging will simply allow you to have multiple completely unrelated tags. The problem is though that users like folders. It gives them a sense of structure, and frankly…, they are used to it. Plus they sometimes offer additional options like limiting what users can do (CCM folders for instance that allow for approval cycles on documents added to their folders) and offering options to link folders to communities. So IBM implemented folders. At first only as in Shared folders. And as it figured restricting files to only one folder wasn’t ‘social’ they gave files the option of being shared with more than one shared folder. That was actually quite inventive but users wanted more. They wanted nested folders. So then, with the advent of CCM, users got CCM Folders with security options and the much asked for option to nest folders (subfolders). That was a major change that a lot of users liked as it was something they were used to while using file shares. Unfortunately CCM did require additional licenses which, for a lot of organizations, proofed to be a big deterrent in implementing it. And lastly, with CR4, we now have Community folders. Great! So enough choice for our users! What is the problem? Take for instance the fact that you can place (share) a file in more than one Shared Folder but only in one CCM or Community folder and there is your first confusion…. Adding files is one thing, moving them around between folders another! Where do my Folders show up? A big thing in working with any feature is that it’s behaviour is recognisable to the users. So I set out to test how folders and files in them are depicted to the users. Would they for instance be shown on the homepage of a community and how do you know in which folder a document is located? Can you see files recently added to folders on the community Homepage? No, only in the Shared Folder itself. To see the files the user will have to open the Shared Folder On the Community Homepage all recent CCM files will be shown in the Files section including any added to a CCM folder. There are no folders visible on the Homepage so from the homepage it is impossible to see whether that file is in the Library or within a folder within the library. On the Community Homepage all recent files will be shown in the Files section including any added to a community folder. Apart from the default options IBM Connections has some additional features you would normally not find in for instance a File system folder. These can help the user keep track of things changing and help them download document sets and are therefore great features! It all works and all does what it needs to do but it doesn’t always work together or work together well. Moving files around, how you can share information in folders, where you see your information and what options you get… Each of these folder structures seems to have its own logic and implementation. That is what I find confusing and I’m sure a lot of users will find confusing too. Don’t get me wrong, I can understand why certain things work differently and I can also understand that certain things are simply still under development (like the fact I can’t view community folders in my Windows Explorer plug-in) but the problem is most users might not understand if you don’t tell them. So there is a definite need, when implementing these features to explain them to your users. Better yet, come up with a content strategy. In my next blog, the last of this series, I will talk a bit about the things you have to consider while deciding on how to use folders in IBM Connections. Ownership is quite important in IBM Connection when it comes to data. Why? Well because ownership isn’t always straight forward and sometimes data shouldn’t be public. Obvious! Why would you even need to say that? Well… The premises of any social platform like IBM Connections is to share. That means that in theory the thinking is that every file you put into your social platform should be ‘public’ (e.g. findable and accessible to all). Reality of course is that this is not always the case. Even in a very ‘open’ organization certain files will still require protection and limited access. This is one of the reasons why users in IBM Connections can specify “Sharing” settings on files they upload as well as folders and communities they create, restricting access to only specific groups or users. The basic idea is though, and this is something you feel very clearly when working with IBM Connections, that everything is open, unless. In the first case, uploading a file into personal files, the file will always remain in the ownership of the user. The standard security level setting for personal files is ‘Private’, meaning no one can access apart from the owner. The owner can however decide to make a file ‘Public’ (accessible to all) or grant specific Editor or Reader access to specific users, groups or communities. Ownership and full control will always remain with the original user though. A file stored directly into the community however is different. Ownership of these files lies not with the user that uploaded it into the community but with the community. All users of that community from then on have equal rights to that document. This means that if the user uploads a file into a restricted community and is subsequently removed as a member of that community, the file remains in the community and is no longer accessible to the user that originally uploaded it. A similar structure applies to folders. Folders created in a users personal files section will always remain in the ownership of that user. Folders created as Community folders and/or CCM folders however will always be property of the community, not the creating user. This also implies the biggest restriction which is that a folder created within a community or CCM Library can never be shared across communities while Folders created as personal folders can be shared with more then one community, group or user. CCM folders have one added element to keep in mind which is that they allow for imposing additional access restrictions on folders by limiting edit access to specific subgroups of community users. You can for instance use this to restrict that only a few of the community users are allowed to edit the information in a CCM folder. Read access however will always be there to all community members though and the user creating the folder as well as the community owners cannot be revoked as owner of that folder unless they are removed from the community. Which brings me to another peculiarity of shared folders…. A folder in the traditional sense as people know them from for instance their file drive is a place, a physical location to store a file. Meaning a file can only reside in one folder at the time. 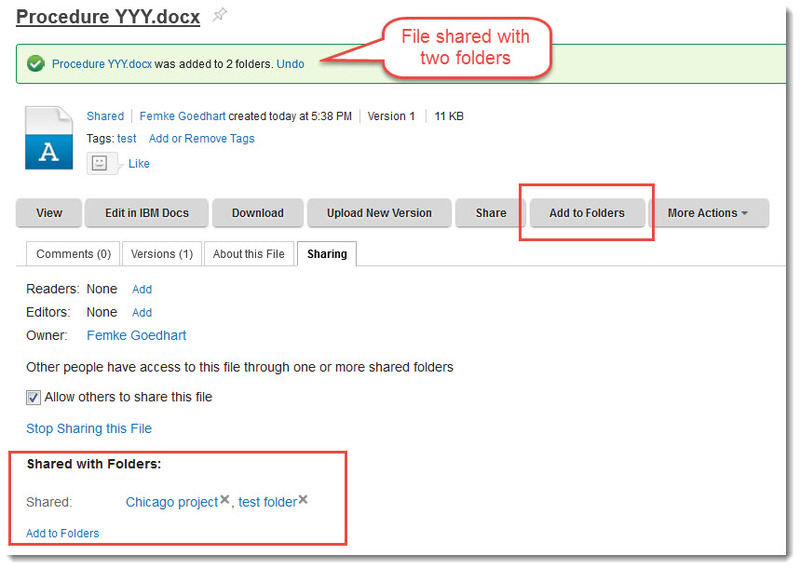 Shared folders however are different as a file can be added to more then one Shared folder. So in a way shared folders aren’t really ‘folders’ at all, they are collection sets and almost act the same as tags. After all a tag is nothing else then a categorization and several files having the same tag can be seen as a collection as well. The difference between a shared folder and a tag in IBM Connections is though, that you can control access and Share a shared folder and you can’t do that with a tag. So keep in mind that a Shared folder is significantly different from a community or CCM folder as those are more aligned to the standard concept of folders while Shared Folders in a way hold the middle between a Tag and a folder. So… why would you create folders within communities if personal (Shared) folders give you more options to share across communities & user groups and allow you to have information in them that is also shared in other folders? Well because there are some risks with having shared folders. For one, users don’t always realize the implications of putting a file in a folder shared by someone else. No problem if the community (and therefore the data in it) is public anyway but what if you have a Restricted community that has a shared folder which is also shared with another Community? A user might think that because he is adding a file to a folder within the Restricted community that therefore the file itself is also only shared within that community. Unknowingly though he might be sharing that file with other users & communities. Only if he actively opens the sharing tab will he see that it is also shared with other communities and therefore visible to not only the users of the (restricted) community he thought he was adding it to, but any other communities/users that folder was shared with as well. Next up I will go into how you can work with the different types of folders and what differences and similarities are between them. I hope to publish this tomorrow.